One of the ironies of childhood is that our first introduction to reading often comes in the form of fairy tales and myths in which magic, mysticism, fantastical creatures and mysterious realms appear with such frequency as to seem entirely plausible to impressionable young minds. Once we cross the threshold of adolescence, though, there’s no shortage of messaging from parentals and teachers that these make-believe worlds need to be summarily shelved in order to make room for the pursuit of fact-based realities. Unless, of course, you were born with the imagination of a writer like Sandra Hurst and embrace the elements of YA fantasy—and infinite possibility—with full-fledged gusto. 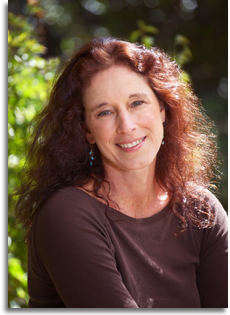 We’re delighted to welcome her to share insights on her new release, Y’Keta. Q: Given your childhood years in England and then Canada, would you say that you chose the genre of fantasy or that it, in fact, chose you? Q: What are some of the favorite titles and authors we might have found on the nightstand of a very young Sandra Hurst? A: Before Junior High, if you caught me reading at night, which my parents often did, I think that you would have found me huddled under the blankets with The Wind in the Willows, The House on Pooh Corner, or The Sword in the Stone. 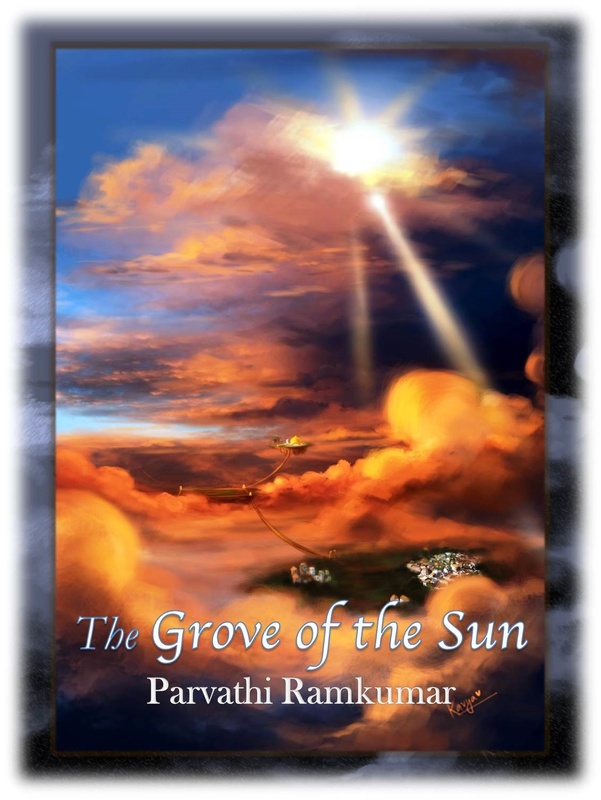 Q: How about as a young adult (coincidentally, one of your chosen age groups for the Sky Road fantasy series)? A: As a young adult, I read anything and everything, I still do. Some of the favourites that I remember from back then are The Mahogany Trinrose (Jacqueline Lichtenberg), Lord of the Rings, (J.R.R. Tolkein), and the Darkover series (Marion Zimmer Bradley). Q: Like a lot of middle school students, you began your classroom writing career with poetry. How would you define that early style and what were some of the topics you liked to write about? A: My first poems had lots of ‘Moon and June’ type rhyming patterns. The oldest one that I can remember was about snow coming down like a blanket on the town. Birthdays were always a big poem opportunity for me, I wrote poems in every birthday card! Q: Is your passion for poetry still as vibrant as ever? A: Poetry will always be important to me, it’s part of finding my creative space as a writer. There is a chapbook of my poetry in the works, although for right now, the prose has centre stage. Q: What does writing verse teach you about writing books? A: I think that poetry teaches prose writers to understand the rhythm and flow of language. One thing that I’ve learned from poetry and applied to my writing is to always read through my draft out loud. If I’m reading through a paragraph and consistently trip at the same place, I know that the rhythm there is off and I need to see if more explanation is needed for that thought, or if I’m overcomplicating the sentence. Q: What was the inspiration behind Y’Keta? A: The central question in Y’keta is about identity. Is Y’keta willing to give up his identity to please his father? Is he willing to risk being honest about himself, even though he may lose everything he has grown to love. The inspiration for this came out of two unconnected events about four years ago, the first was a casual comment made by a relative on the reactions she dealt with when she came out as LGBTQ in the early 80s, the other was a long night sitting beside a campfire in Grande Cache, Alberta watching the Northern Lights dance over the horizon. Q: One of the things that always fascinates me about fantasy novels and stories set in alternative realms/universes is how their authors come up with the unusual names for their characters, objects and settings. Can you let us in on your own approach to the name game? A: The language I used for the People borrows liberally from several modern native languages which I have ‘aged’ in different directions to suit the Sky Road. While I wanted to keep the feel of the original tongues, I tried to avoid having words that were too exact and would tie the story down to one tribe over another. So, for example, the Nehewak (Cree) word for Thunderbird (kitowak) becomes my race the Waki’tani and the Tlingit word for pig becomes a rude nickname that Siann calls her greedy little brother. Q: What sort of myths are incorporated in the Y’Keta storyline? A: Y’keta is based on several Indigenous myths from the Cree, Haida Gwaii, and Pacific Northwest areas. Each of these groups have legends about a people called by various names but all adding up to the Thunderbirds. It’s interesting to note that even now, the Nehewak don’t have a word for thunder. They say kâh-kitowak, “the Thunderbird’s call”. I’ve also incorporated parts of a several legends from the southern US to create my bad guys, the Utlaak, these legends feature scaly or serpentine bad guys who come from an underground world. Q: Which scene was the easiest for you to write? A: I think the easiest scene in Y’keta was the first one. The characters’ voices were so clear and I could visualize the ceremony where they all became a part of the village and started interacting with each other. The first draft, 15-20 pages, was written all in one shot in the course of an evening, while listening to Loon Echo Lake, on my headphones. A: I hate killing people! The scene where one of my main characters is murdered in an Utlaak raid shattered me. I wrote it with tears pouring down my face, then re-wrote it, and re-wrote it, until I felt the hurt as much on the paper as it did inside me. Q: On Amazon, the title is listed as Volume 1. How many volumes do you have in mind? A: The Sky Road is planned as a trilogy. In Book One, Y’keta, A young exile, searches for a place to belong, only to find his new home threatened by secrets from his past. If Y’keta reveals what he knows to the villagers, it will tear their history and traditions apart…but sharing his secrets may be their only hope for survival when the Village comes under attack. Book two is at the necklace stage, that is the point in my writing process when I have ‘pearls’ written, but desperately need the thread of the story to tie them together. It will focus on the continuing war with the Utlaak and Y’keta’s unsettled relationship with his father. 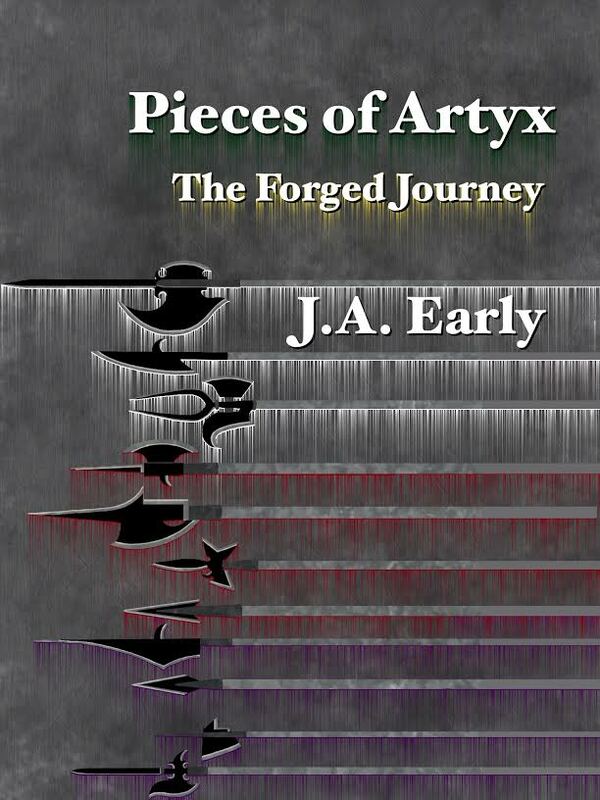 In book three Siann struggles to accept the power that the Lightning Stones have given her. Power is not always a good thing, and she has some hard choices to make about using or abusing it. Q: What governed your choice to develop a series versus a stand-alone title? A: I don’t ever remember thinking ‘Hey! I’ll make a trilogy!’ The storyline just grew into one. I think it’s all D’vhan’s fault, he’s one of the lead male characters. He refused to stay in the background, and before I knew it I had an uprising of characters whose stories deserved to be told. Q: More and more authors are seeking to control their intellectual property by going the self-publishing route. What have you learned about the challenges of this choice that you didn’t know before you started? A: What didn’t I know? Is everything a fair answer? My decision to self publish was driven more by a need to put a physical copy of the book in my dad’s hands for his 90th birthday. I think that the learning curve for either type of publishing is terribly steep for someone like me, who knew nothing about the industry. Traditional publishing takes time, patience and a degree of luck to hit the right agent at the right time. Independent publishing takes all of that plus a substantial cash investment in editors, cover artists, printers etc. Social media is also crucial to an indie author, as word of mouth is often the only marketing tool we have access to. A: I’m most creative at night, when the whirlwind I call a mind has quieted down for the day. I put some music on and let my world go and step into Y’keta’s world. My family learned early that ‘I’ll be there soon’ really meant “I’ll see you in the morning.” At least 75 percent of the book was written between midnight and 5am. Other great creative places for me are restaurants like Denny’s, or Tim Horton’s. I often go to grab a coffee, plug in my tablet, hide behind my earphones and just blend into the crowds. Q: Conversely, when does it feel the most challenging or frustrating to work at your craft? A: Handling my own nature is the hardest part of writing for me. I tend to be very distractible and moderately obsessive. There is always that one more piece of research, a new book to read, and, Oh Look! I got a Facebook mention. My mind will bounce to anything new and shiny and sometimes when it lands on a topic I find it hard to let go and get back to the writing. There is a definite benefit to this type of mind though, once I start writing and the scenes are flying, I will keep going until someone pulls me out. A: I like to shake things up when I’m in a slump or struggling for ideas. I will sometimes take a side character and re-write a scene from their point of view. It helps me see with new eyes and often gives me the next question that I need to ask or the next move I need to make. Another good trick is to pick the one thing that my character would really hate to have happen, and make it so. Are they afraid of water? Then maybe the boat sinks. Q: Tell us a little about your family and whether they’re allowed sneak peeks at your work or have to wait like the rest of us until it’s all finished? A: I live in Calgary, Alberta with my husband and son, both of whom I love dearly, and have put up for sale on e-bay when their behaviour demanded it. My day to day life is a balance between my outside life as a paralegal counsellor and my inner life as an author/poet. I do try out scenarios and words on my family now and again, especially on my son, who is around the target audience for my books. Q: What do you do when you’re not writing (i.e., day-job, hobbies, travel)? A: When I’m not writing or doing double duty as a wife/mother, you can find me working as a paralegal in Calgary. On off days, or holidays we spend a lot of time out in the mountains camping, canoeing and just listening to the quiet. I also enjoy time with the other amazing writers in the Calgary and love going to the write-ins and open mic. events. Q: What’s something quirky/unique/unusual about you that readers would be the most surprised to know? A: Ooh, you really want to go there? I think that answer would depend on who you talk to. My son would cringe and point to ‘opera nights,’ evenings when I don’t speak and insist on singing my answers to any questions. My husband might point to my fits of insomnia and my late-night Facebook addiction. But really! You meet the best people online at 3am. If there is one thing I would say was unique or quirky about me it would be my breadth of interests, I’m a bit of a Hermione, a collector of odd facts and knowledge about anything from the Kaiju culture of manga Japan, to Shakespeare, to Opera, or the band Nightwish. There isnt much that I won’t listen to, read, learn about and find value in. A:I think the common thread in all my heroes, whether real or literary, is that they had the opportunity to quit, every reason to say I’m too old, too tired, it’s just easier to let it be someone else’s problem. This kind of hero, unwilling, often flawed, yet willing to step up, gets me every time. These heroes all have one thing in common. They are people very much like I am, broken and damaged people just trying to do their best with the time they are given. As far as literary heroes, I love the authors who can make words dance and sentences mean things. This has led me to authors like Guy Gavriel Kay, and Don Dellilo. I would give my left ovary (not so dramatic a thing since at 54 those parts are hardly crucial) to sit down with either of these gentlemen, or even better their writing notes, for an afternoon. Q: Who’s your favorite character in a book (other than your own)? A: There is no fair way to give one answer to that question, but one of my favourites is Richard Lamb, from M.K. Wrenn’s sci-fi series The Phoenix Legacy. He is a young intellectual working to prevent the oncoming dark age. Q: Have your own characters ever surprised you? A: Constantly! No matter how well I think I know the characters, when I put two or three of them together the dynamics always amaze me. A: Next up for me is When Words Collide in Calgary in mid August, then finishing up a romance novella which will be coming out in 2018, then back to Book 2 of the Sky Road. A: Christina, Thank you so much for letting me talk to your readers and introducing them to the Sky Road. I’m really enjoying Y’keta’s journey through this ancient land and look forward to meeting your readers as they walk the Road with me. C.S. Lakin is a prolific author, blogger and advocate for writers, with her website Live Write Thrive (http://livewritethrive.com/ which is aptly named), writing workshops and critiquing/editing services. 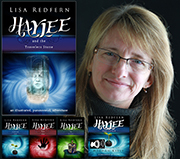 As an author of fairy tales for adults, she combines Christian scripture with myth and fairy tale to evoke fascinating worlds. It is a treat to experience her work, fiction or nonfiction, because of the heart behind her words. It was a pleasure to chat with her about her Gates of Heaven series, her upcoming workshop and how-to book – Shoot Your Novel – and to get a broader perspective on writing and engaging with others in this digital, fast-paced age. Q: As an author of fairy tales for adults, you manage to employ recurring themes and rich textures without upsetting the balance between too much or too little description and the messages don’t become overly repetitive. How do you weave these aspects into your stories? A: Thanks for the compliment on my writing. I always start with themes, since those are the most important to me. And once I have themes, I try to come up with some motifs, which can be ideas or quotes, that are repeated by the characters throughout. As far as textures go, I’m all about beautiful language and imagery—the more the better. I’ve been writing novels for nearly 30 years. I have over a million words in print. So it’s just putting that requisite 10,000 hours in to become proficient as a writer. I feel like it takes about 4-5 novels to get a voice, a style, a rhythm. I think craft/skill is 95% and the other 5% is inspiration and creativity. That’s why a lot of untalented people can write good, successful books without really having talent. My agent told me that—only 5% is talent. But sometimes that 5% is amazing and stands out. But overall, writing is like learning anything. It’s a skill anyone can learn if they put their mind to it. I’ve just developed my style through practice, such that I rarely ever write past a first draft. I usually edit and proofread my first draft and it’s done. I plot extensively but also listen to my intuition. I just wrote a blog post on that. And now I have a series on mind mapping and brainstorming, and I do that a lot. Q: What is your favorite method of research for your Gates of Heaven series? A: I read fairy tales. Hundreds of them. I’m finishing the last book, though, and I am so happy with the variety of themes and topics and characters. I feel I have created a wonderful, amazing world. Q: Even as a series, each book stands alone. Does your process of writing change with a Gates of Heaven book from your process of writing your contemporary fiction or other fiction such as Time Sniffers? A: Hmm, if you are talking about the difference between writing a series and a stand-alone, there can be huge differences. 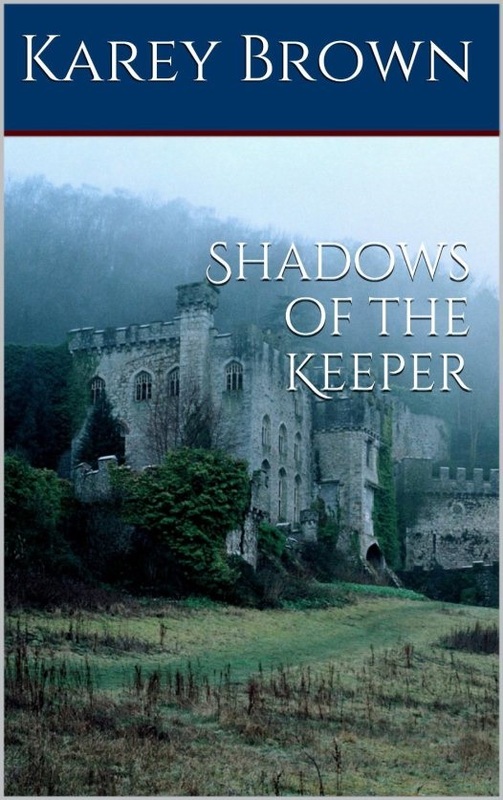 With a seven-book series like mine, I have one overarching world with overlapping locales and characters, but with a complete fairy tale in the story. Since I decided to have seven sites in seven places, I had to create almost a new world for each book. It’s been a challenge but the last book is like the final curtain, bringing all the main characters from the first six books together, although I’m trying to also make it a stand-alone book. And it’s a story within a story within a story, so that’s a huge challenge. Q: Wow! That will be fascinating to see how you create that, when the books are already multi-layered. You have held a series of “Writing for Life” workshops for writers earlier this year, with your next event scheduled for December (“Sizzling Scenes”). What do you enjoy most with these workshops? A: I love teaching these workshops and seeing how these new perspectives help writers become better writers. All the material I teach is also on my blog, Live Write Thrive. Q: What can we expect from “Sizzling Scenes”? A: I created this workshop because I see as the biggest problem with my critique and editing clients that few writers know how to correctly craft a scene. There really are “rules” to structuring scenes, and I like to liken it to preparing a meal, with many different entrees. A dish must have spices, have a surprise, leave a specific aftertaste, etc. You’ll just have to take the workshop to get the whole flavor! Q: I love that analogy. Among your posts on Live Write Thrive are those about “shooting your novel,” some of which will be included in your upcoming how-to. What inspired you to approach novel-writing in the context of film technique? A: I was raised in the TV industry and spent my growing-up years reading scripts and on sets. So I have a cinematic take on writing fiction. Some of the best novelists were first screenwriters. It’s crucial to make scenes visual in a way the reader can picture events unfolding in real time. Readers are so accustomed to movies and TV that they expect book scenes to also have this technique. This entire year covers all this movie technique. The book, Shoot Your Novel, will hopefully be out soon! Q: On Live Write Thrive you share your critique checklist and different paid options for your critique services. What is the most challenging, and the most rewarding, aspect to critiquing the works of others? A: I love the challenge of working on every kind of genre with clients in six continents. It’s so fun and exciting. The reward is in seeing writers grow in their love of writing and their ability. I’ve watched so many writers I’ve coached go from writing a train wreck of a novel to a masterpiece that sells big or wins awards. I love helping writers as much as I love writing, so I’m always torn between wanting to do both. Right now I work full-time doing critiques and edits, and still write two novels a year. It’s a challenge but I don’t want to cut back on either activity. Q: That’s amazing! How do you manage to juggle everything? A: I get up early, run two miles on my treadmill at about 6:30, spend most of the morning working in between throwing the Frisbee for the lab. I go to the library from 11-5. I write fast because I’ve learned to do that. I don’t rush my editing, though. Q: Smart to have a schedule like that. You share many articles and guest posts on your site, and you have built quite a large social media presence. There is a fine line between being engaged and becoming overloaded–how do you navigate that? I was taught the best way to draw fans and readers and clients is to share as much free information as possible, and I love to do that, so I dedicate a lot of my time to my blog. I write about 150,000 words a year on my blog, the equivalent of a couple of novels. I also tweet my posts, put on Facebook, and share with about 30 LinkedIn groups. I love how discussions ensue and people write me every day to thank me for the great info. Basically I felt I wasted twenty years as a writer floundering around not knowing what I was doing, so my hope is to teach methods in a way that will spare other writers the grief I went through. Q: Much appreciated! On your site, you offer your editing services. How would you say editing others has strengthened you as a writer? A: Editing definitely helps me as a writer, especially reading so many beginning novels and noting what is missing or wrong. Q: How did you develop as an editor—were you an editor first, or did you learn as you wrote and worked with other editors? A: I’ve been writing novels for nearly thirty years. I’ve also been editing a while but didn’t begin taking it seriously, in terms of learning Chicago style and making book editing my career, until five years ago. I was still writing novels full-time, but in the last two years moved to full-time editing. Since I’ve written about fourteen novels, in a half-dozen genres, I began to specialize in critiques, since most editors aren’t novelists, so now about 90% of my work is critiques—I do about 200 a year of various lengths. I have a couple of great copyeditors on my team who often do the initial content editing for my clients, but I always have my hands and eyes on the projects and do all the final proofreading. I’ve never “worked” with other editors, but I am on editing loops and groups and learn from others as well as share my insights with them. Q: That’s great. Your website (cslakin.com) notes “In all her books she seeks to journey to the heart of human motivation, to uncover unmet needs, and show the path to healing and grace.” When and how did you determine this was what you wanted to evoke with your writing? I’ve been through a lot of pain and misery in my life, spiritually and emotionally. Like many, I’ve used my writing as a cathartic way to understand and process those experiences. I’ve always been fascinated by the human psyche, and love how complex people are. I’m a very character-driven novelist and most of my books are relational dramas or journeys of the heart for my characters. Q: Yes, I enjoy that about your work. Is there anything else you would like to say? A: I don’t sleep (just kidding). Really, although people look at what I do and are astonished, I look at some of my other author friends and they make me feel like I’m downright lazy. Meaning, don’t compare yourself with other writers. Their journey is their own, and yours is your own. Write because you love it. Cherish the freedom you have to write, even if it’s just a few minutes a day, and remember there are a lot of other people like you out there trying to be the best writer they can be. They are not your competition. Let them be your inspiration. God has a plan for your life and your writing. He won’t tell you what it is, and more than likely, it will not look like the plan you have. That’s how He works. I’m trying to live in that place in peace. It’s not easy, but if you focus on the joy of telling a story and be there to encourage and help others, the journey will be an utter blast! Take off! What do you do after you win a beauty contest, your face launches a thousand ships, everyone goes to war to get you back, and a bunch of Greeks hide themselves inside a big wooden horse outside the gates of Troy? Debut author Sherry Antonetti has tapped her passion for ancient mythology and delivers a compelling tale about a glamorous icon who was smarter than most people thought. Q: Let’s start with what ignited your passion to become a published author. A: I’ve always loved reading beautiful stories. My parents kept placing books in front of me like chocolate truffles. I’d gobble them up and feel full, happy and satisfied and still want more. By the time I got to college, I became an English major, I wanted to know them all. However the writing part of my life didn’t really take flight until 2005 when I was asked to submit a speech I’d made to the local paper. They published it. That beginner’s luck success led me to keep writing. I realized I wanted to create a beautiful story, like a truffle that would leave the reader full, happy, satisfied and hopeful to be invited back for more soon. Q: A lot of aspiring writers tell me, “I don’t have time to write.” As the parent of 10 children, you obviously orchestrated this dilemma successfully. Any been there/done that tips you’d like to share? A: I’m still working on the time management of writing. All I know is to write every day, and remember that all of life is a balancing act. Some days, I do better than others. As for tips to aspiring writers, all of us have the same 24 hours. What we do with those precious seconds every day reveals who we are, what we value, and how the rest of the world will know us. 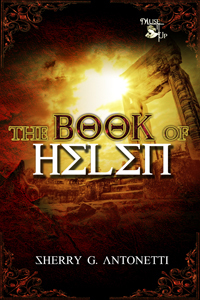 Q: Tell us what The Book of Helen is all about. A: Newly widowed at 65, Helen of Troy finds herself in the odd position of starting over in life with no husband, no family and facing exile on the island of Rhodes. She hopes to establish a legacy including the stories and memories of her life beyond the events both known and embellished, that made her the most famous beautiful woman in the world. Writing this book, I sought to answer three basic questions that go unanswered in the original texts and many of the subsequent reversions of the Helen/Paris/Menelaus Trojan War story. 1) What made Helen leave Sparta? (She’s queen, she’s in charge; she’s the actual power of that world). Most of the versions give her motive short shrift. I wanted her to have a thinking/feeling real reason for her actions and not be a mere pawn of the gods in the machine or carried away purely on emotional adrenaline. 2) What made the Trojans keep her? Yes she brought Spartan gold but eventually, that would have been an insufficient cause. They could have ended the siege by sending her out or killing her. Her beauty would have been sufficient perhaps for Paris, but what made all of Troy decide to stick it out? Helen had to be more than a pretty face to warrant a 10 year war that ended a civilization and somehow survive. 3) What made Menelaus take her back after all of that? She’s the most famous adulterer of the Greek world. She’s shamed him. She’s forced Greece to empty its city states of grown men on her behalf to bring her back. She’s caused the deaths of countless people and suffering to those left behind. The line in the Aeneid, “She bared her breasts, he dropped his sword.” is all the explanation of their reconciliation we get. Yet in The Odyssey, it is clear that the two of them have a happy marriage later in life. So how do we get from running away and a 10 year bloody war to apparent tranquil domestic hearts in accord with one another? Q: What inspired you to make Helen the cornerstone of your story? A: I was reading Fagles’ translation of The Odyssey. The line about Helen slipping a drug (opium) into the wine to allow the men to think about the Trojan War without getting upset jumped out at me. Immediately I wrote a Helen story with the tag, “It started with an apple.” The original idea had been to do a series of tales (sort of an Arabian Nights) based on the various trinkets and treasures Helen deemed sentimental. It turned into something more. I envisioned her as a CEO in a predatory world. Helen became a composite of multiple strong women I’ve known in my life plus a goodly dose of the mythic woman from all the literature. Q: Who do you think this book will most strongly appeal to (and why)? A: Women of all ages I think will find a lot to enjoy in Helen. The book sports three very strong different women as the main characters, all of whom have flaws and gifts. While a male friend who read an early preview of it, described it as Greek Chick Lit meets Game of Thrones. As to why, Helen touches on something primal. Every one of us wants to leave behind something more than our names, something with an epic scope. I think readers will be rooting for Helen to somehow triumph and win everyone’s heart. We all want the happy ending, even for the fallen and the selfish, the vain and the indulgent, because we all want that level of mercy for ourselves. Q: What do you believe is its strongest takeaway value? A: Beauty, truth and memory matter. They are the salt, light and music that make life something other than a grind of suffering. When we opt to deny beauty, deny truth, or ignore memory, we lose something invaluable, part of our history and our humanity. Q: As you began to research all of the myths about Helen, what was your most surprising discovery about her and how did you apply that to developing her character and motivations? A: I discovered Helen to be the original Fan Fiction character. There is only one Odysseus, one Hector, one Achilles and one Penelope, but Helen has been reinvented in almost every age of Western civilization. She’s the archetype of beauty, a succubus of pure sexuality for Faust, consigned to Level 2 of Dante’s inferno for adultery and lust, the victim of the gods, abducted against her will and in one version, she never was unfaithful at all. There are massive intertwined and contradictory myths about Helen spanning the ages. Unraveling them to discern Helen herself, was great fun. Q: Did you do all of the research before you started writing or did you look things up as you went along? A: Research went on constantly. Over the years I read two versions of The Odyssey, tried Greek cooking, watched Troy, I Claudius (yes I know it’s Rome but it helped anyway) and 300, and visited museums and jewelry stores to find “what Helen would wear.” I now own a compendium of Greek myth, three different translations of the Iliad, Homer’s odes, several plays by Euripides, stacks of books on Sparta, and my favorite, Bettany Hughes’ Helen of Troy. Even now, I still see books and art and stories and hear the echoes of Helen’s influence. Q: Does a person have to have a working knowledge of Greek myths, The Odyssey and The Illiad to understand this book? A: No. I tried to treat Helen’s story as real, as opposed to mythic, to ground this historical mythic fictional woman in a historical world so the reader could meet her without any back story. Q: What do you believe your book says about relationships between women and how they treat one another? A: I would say women sometimes confuse the sharing of stories with intimacy and it can lead to very hurt feelings. Friendship is something developed over time, through gradual increased illustrations of trust, of service, and shared gifts of the self. It cannot be imposed through generosity or forced proximity. As a young mom, I often mistook experiences in common, (I’m a mom, you’re a mom) for deeper things, out of my own need for a connection. I wouldn’t say that’s a female trait, I’d say it is a human natural response to loneliness. Such relationships are not always what we imagine or hope. Even if we know they aren’t the healthiest, sometimes, we will cling anyway, because the idea of being alone seems far more unbearable. Q: You’ve indicated that the book took six years to complete. If you could go back and talk to your younger self – the 40 year old with only 8 kids at the time – what advice would you give? A: For the writer me: Read the myths. The story is there waiting for you to uncover. Outline. It won’t kill the inspiration or the story. For the parent me: Enjoy this time. You have time for all of this, for all of them. I promise. It’s awesome being their mom. Q: Tell us about the process you went through to find the right publisher. Q: What do you know about the publishing world now that you didn’t know when you started out? A: Read writers’ and agents’ blogs about promotions, marketing and launching. You can’t be ignorant about social media. The landscape of promoting a book is very different from the process of writing and editing a book, and navigating it well requires a level of expertise that can only be crafted over time. A: Learning that lesson I just gave to my six year younger self and doing the research and writing of the Book of Penelope. I have to ban Helen from my head so I can start fresh. A: Writing a book is rather like having ten children. You don’t start out with ten. You start out with that first moment when you know you are expecting your first. You don’t start out with the whole book, you start with an idea that tickles you and you know it could be something more. It takes a long time to grow that whole idea into something as civilized as a book. It takes the whole of a life to raise a human being. Every book and every human has the potential to be magnificent. We just need to give them the time, craft, care and love they require. A: I have a blog, sherryantonettiwrites.blogspot.com which is more personal in nature and a Facebook page for The Book of Helen. If you leave a comment at either, I’m sure to respond as I update both regularly.